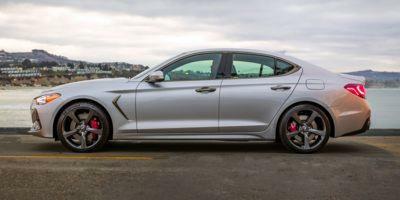 Be the first to review this 2019 Genesis G70. The new 2019 Genesis G70 compact sport sedan joins the larger G80 and G90 sedans for the 2019 model year. The latest entrant from Hyundai’s luxury-level Genesis brand is a close relative of Kia’s recently-launched Stinger. Improved dynamics give the 2019 G70 a performance boost over the Stinger, but the luxury compact Genesis sedan has less interior space. Ready to compete vigorously against such familiar sport sedans as the BMW 3-Series and Mercedes-Benz C-Class, the G70 is tuned for sportier behavior than its Kia cousin. Not only is the G70 smaller and more posh than the Stinger, it’s a sedan (with trunk) rather than a hatchback. Two versions are available: 2.0T with a turbocharged 4-cylinder engine, and 3.3T with V-6 power. Advanced, Elite, Prestige, Dynamic, and Sport trim levels are offered with the 4-cylinder engine. Only four trims are available with V-6 power. Unlike Kia’s Stinger, the G70 can be equipped with a manual gearbox, as an alternative to automatic. In the 2.0T, the turbo four develops 252 horsepower and 260 pound-feet of torque. An 8-speed automatic transmission with paddle shifters is standard, but a 6-speed manual transmission is optional (raising horsepower to 255). Only the automatic mates with the 3.3T’s 365-horsepower turbocharged V-6, rated at 376 pound-feet. Rear-wheel drive is standard, but all-wheel drive can be substituted on all models except the manual-transmission 2.0T Sport. Each G70 incorporates launch control. All V-6 sedans and the 2.0T Sport get a limited-slip differential, promising improved cornering and control. Brembo brakes are available, to enhance stopping power. Options include a 15-speaker Lexicon audio system and leather upholstery. Numerous active safety features are standard, including adaptive cruise control, forward- collision warning with pedestrian detection and automatic emergency braking, and active lane control. Blind-spot monitoring includes rear cross-traffic warnings. Also standard are a rearview camera, driver attention warning, and automatic high-beams. Prestige trim adds a surround-view camera system, as well as adaptive headlights that move to point the way through curves or corners. No crash-testing has been undertaken by either the National Highway Traffic Safety Administration or the Insurance Institute for Highway Safety. Two special-edition models have been available, in limited quantity: Dynamic and Design. Each is based on the 3.3T Sport. 2.0T Advanced ($34,900 rear-drive, $36,900 all-wheel drive) comes with the 4-cylinder engine, 18-inch alloy wheels, synthetic leather seat trim, remote keyless entry, power driver’s seat with power lumbar support, heated mirrors, dual-zone automatic climate control, LED daytime running lights and taillights, 60/40-split folding rear seat, and auto-dimming mirror. 2.0T Dynamic ($43,900 rear-drive, $45,900 all-wheel drive) includes a limited-slip differential (on rear-drive models) and 19-inch alloy wheels with summer tires. 2.0T Sport ($44,900 rear-drive, $46,900 all-wheel drive) includes 19-inch wheels, an adaptive suspension, alloy pedals, dark chrome grille, dark tint taillight covers, and Nappa leather seat trim with Sport quilting. 2.0T Sport manual ($37,900) has a 6-speed manual gearbox, sport exhaust, manual parking brake, aluminum door and console trim, and power driver’s seat cushion extension. 2.0T Elite ($39,900 rear-drive, $41,900 all-wheel drive) includes a sunroof, low-beam assist, rain-sensing wipers, front/rear parking sensors, and wireless smartphone charging. 2.0T Prestige ($44,900 all-wheel drive) includes Nappa leather seat upholstery with Luxury quilting, a head-up display, a surround-view camera system, heated rear seats, and synthetic suede headliner. 3.3T Advanced ($43,750 rear-drive, $45,750 all-wheel drive) is similar to 2.0T Advanced, but with V-6 engine. Standard features include a power-adjustable steering wheel, Brembo brakes, dual exhaust, sport-tuned suspension, variable ratio steering, navigation, and heated and cooled leather front seats. 3.3T Elite ($45,500 rear-drive, $47,500 all-wheel drive) is similar to 2.0T Elite. 3.3T Prestige ($48,000 rear-drive, $50,000 all-wheel drive) is similar to 2.0T Prestige. 3.3T Sport ($49,500 rear-drive, $51,500 all-wheel drive) is similar to 2.0T Sport, with alloy pedals, an adaptive suspension, and dark tint taillight covers. 3.3T Design Edition ($48,750 rear-drive, $50,750 all-wheel drive) comes with Black Forest Green body color, Nappa leather upholstery with Luxury quilting, 19-inch wheels, and heated steering wheel (AWD). 3.3T Dynamic Edition ($50,250 rear-drive, $52,250 all-wheel drive) features Michelin Pilot Sport 4S tires, performance brake pads, an adaptive suspension, and tire mobility kit. A particularly capable newcomer, the new G70 sedan bursts into a new branch of the sedan market. Nearly three inches shorter in wheelbase than the Kia Stinger to which it’s related, the G70 is 5.8 inches shorter overall. Most body dimensions come within an inch or two of its likely rivals, cars such as the BMW 3-Series and Audi A4. Designers melded an aggressive stance with premium-sedan detailing, creating a sedan that can be branded both sporty and luxurious. Essentially, the G70 design descends from the larger Genesis G80. Front fenders and lower bumpers, as well as the nose itself, convey assertive intentions. A long, creased hood and hexagonal mesh grille complement the winged Genesis badge. Energetic air intakes and dynamic strakes, along with boomerang-shaped elements, help to evoke a sense of adventure. In any trim level, the G70 is packed with appealing features that blend sport with luxury. Horizontal lines highlight the dashboard, while the center stack and the small-diameter steering wheel lean toward the driver. The information screen rises from the center. Diamond-tufted leather upholstery and knurled dials suggest upper-end luxury motorcars. Front seats are sporty and supportive as well as spacious, substantially bolstered, and ready for long-term comfort. Back-seat space is acceptable for adults but on the tight side, especially for taller riders. At 10.5 cubic feet, the trunk is surprisingly small for a car in this class, but its rear seats fold down. Proven on the N++rburgring track, the G70 promises nimble yet neutral handling, with sharper, more predictable moves than Kia’s Stinger. Ride quality is firmer - especially in V-6 models - but not excessively harsh. Backed by brisk responses, on-road dynamics qualify as exceptional. Acceleration to 60 mph takes about 6.5 seconds with the turbo-4, versus a rocket-like 4.5 seconds with the potent, lively V-6. Peak V-6 horsepower emerges at a lofty 6,000 rpm. Though reasonably quiet, the V-6 can howl when pushed hard. The 8-speed automatic yields responsive shifts. Rev-matching can smooth downshifts during high-performance driving. A little lighter than Kia’s Stinger, the G70 uses aluminum for the hood and suspension components, boosting handling while saving weight. All three levels of suspension tuning are stiffer than Kia’s. The 4-cylinder models are softest, while the 3.3T Dynamic Edition is stiffest. On lumpy pavement, even base 2.0T models yield a firm ride. Suspension stiffness translates to sharp handling. A G70 flows gracefully along curvy roads. Its steering feels properly weighted, with ample on-center stability and balanced cornering. Fuel economy is passable, considering engine power. With automatic, rear-drive, and the turbo 4-cylinder, the G70 is EPA-rated at 22/30 mpg City/Highway, or 25 mpg Combined. Manual shift drops the estimate to 18/28/22 mpg. With all-wheel drive and automatic, the turbo-4 is EPA-rated at 21/28 mpg City/Highway, or 23 mpg Combined. The rear-drive V-6 model is EPA-rated at 18/26 mpg City/Highway, or 21 mpg Combined, versus 18/25/20 mpg for the all-wheel-drive version. Hyundai’s Genesis brand has created a worthy competitor to German entry-luxury sport sedans. Genesis’ G70 offers a broad variety of trim levels, with two hearty engine choices. Even the base 2.0T Advanced model holds plenty of standard equipment. Driving impressions by Kirk Bell, The Car Connection. James M. Flammang contributed to this report. 2019 Genesis listings within 25 miles of your ZIP code. Find 2019 Genesis listings for sale near you.